Deliver, set-up and start pouring concrete ten's of hours faster than your competition...Every foot counts! 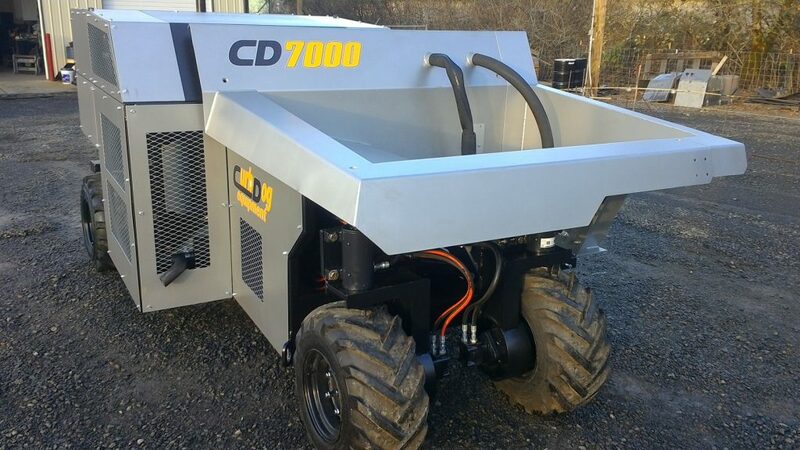 The CD9700 weighs in at just under 10,000lbs...No DOT issues here. Yet with its 70" trimmer and iTerra digital computer/controller, the CD9700 can bring home the bacon and cook it too! CurbDogs' middleweight contender. At just over 7,000lbs, this slipform curbing machine will boldly go where no other curber can. Innovative, articulating saw-head with up to a 48" blade, will have you cutting concrete that most contractors did not think possible just a few years ago. CurbDog Equipment's philosophy is simple...work smarter, not harder. If pouring 1000' of curb and gutter can be done in eight hours with four employees as apposed to two days with 8-10 employees, wouldn't the choice be easy? We think so. At CurbDog Equipment, our goals are as simple as our philosophy...Give YOU the tools and the capability to maximize every lineal foot of curb that needs to be poured on your construction site. We not only provide you with cutting edge technology, but with a library of knowledge as well to help get you on your way. Our knowledgeable staff can help with personalized training that will propel your company leagues beyond your competition. Call us today. Ask us questions. Let us help you understand the ramifications of your investment. It takes money to make money. Shouldn't every dollar count? We can help...from financing oportunities to pre-owned slipform pavers, we can get you on your way. Let us show you how!